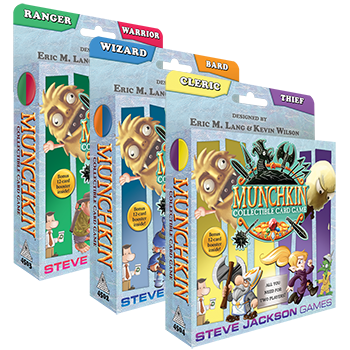 The new Munchkin Collectible Card Game, designed by Eric Lang and Kevin Wilson, reaches stores on February 21! We first announced this game at the GAMA show in 2016, and over the last two years, our team has been taking the design all of the way through the development, playtesting, and production process. Watching players sit down with the game at prerelease events over the last few months has been a treat that confirms what we thought all along: This is a fantastic two-player Munchkin experience that's an entirely new way to show your opponents how devious and brutal you are. As a new game, we know many of you will limit yourself to a single starter when you first give the game a try. There are three different starters available - Ranger & Warrior, Wizard & Bard, and Cleric & Thief - and each of those $19.95 sets includes everything you need to sit down with a friend and start playing right away. We wanted the game playable quickly, out of the box, but we also wanted to give players a taste of the customization options available, so we included a single randomized booster pack in the game's first printing. You can identify the first printing by the visual seal on the box front. Later printings of the game (starting in June) will not include a booster; the bonus booster pack is only in this first release of the game. With over 300 different cards in the game's core set, adding boosters to those fixed starter decks is a great way to dabble in constructing your own decks, and we hope that the free booster packed inside the first-printing starters gives you an idea of the game's customization possibilities.